As if I haven’t been busy enough, my most exciting news is that I’ll be in two craft fairs this summer! This has been a dream of mine since my parents started dragging me to fairs as a small child. 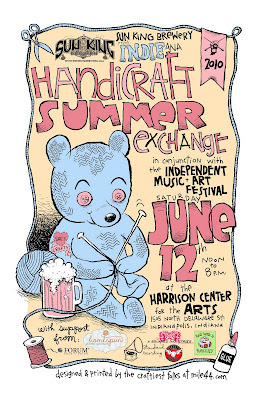 I’ll be participating in the INDIEana Handicraft Summer Exchange in Indianapolis, IN. Below is the information…check it out! I’m also participating in the famous 2nd Annual Renegade Craft Fair in Los Angeles! If you’re in the area on July 24th-25th, feel free to swing by and say hello! First Shipment to a Retailer! I’ve been a little out of touch lately, but it’s not because I’ve been sitting around eating bon bons and catching up on my soaps…oh, quite the opposite actually! I was contacted a few months ago from a retailer opening a handmade store in Jackson Hole, Wyoming who was interested in carrying my pillows. Very exciting and lots of work! I’ve had my head buried in my sewing machine finishing all ten pillows he requested and just sent them out last weekend! What a huge feat, but I couldn’t be more thrilled. It’s been a while since my last posting and to be honest, it’s because I’ve been struggling on where I want to take this blog. My initial reason for starting a blog was to discuss my fledgling business, but since there is only so many ways I can talk about pillows and wall art, I’ve decided to post anything that I find inspiring, interesting, or that even makes me laugh. Because let’s face it, I am overly enthusiastic about pillows and embroidery, but even I don’t want to read a whole blog dedicated to just those things! But first things first, I should probably expand a little on what White Nest creates and sells. I started cross-stitching when I was 9 and within a year, I was doing counted cross stitch on the smallest count Aida cloth I could find. Some of my earlier works included panda bears, snow men, and orca whales (come on, I was 9…). I stopped doing that shortly after (hello, I was 9 and had perfected it already…where was the challenge??) and picked up embroidery about a year ago. Although it’s similar to cross-stitch, I love how I could create my own patterns and how graphic and simple the designs were…so after I got the embroidery bug, I decided to make a few pillows and to my complete delight, the pillows were turning out better than I could have imagined! Then I got the crazy idea of making a large geometric print, a la famed designer David Hicks-style. And yes, when this was finally complete, I did a little dance in my living room. Loved how it turned out! After I got into the groove of the pillows, I started thinking of other things I could embroidery. One of the more common ways to display embroidery is to leave it in the round hoop and hang it on the wall. I wanted to use this idea, but in a more modern way…presto! Why not wrap the embroidered fabric on to paint canvases? Today is Valentine’s Day and the obvious answer to “Who’s my Valentine?” would be my husband (and it is), but one of my many loves is a fabric store. That’s right, I said it…a fabric store. 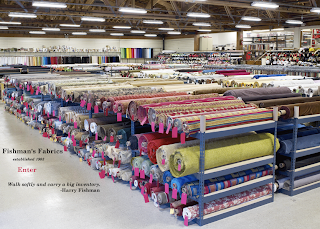 If you’re from Chicago then you may know about Fishman Fabrics, a hidden gem in the city where you can find deeply discounted, high-end fabrics. It’s been around for years (which is quite evident in it’s 50′s style sign), and is pure excitement for a girl who has champagne taste on a beer budget. These are some of the awesome (!) 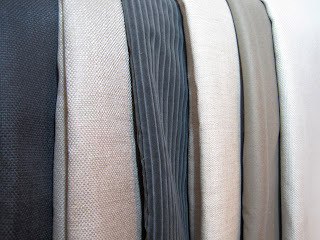 fabrics I found…I only wish you could all feel how heavy they are. I can’t wait to start using them for new White Nest pillows! Mmmm…yummy. Oh boy, here we go…! I started searching for local crafters on the web and ran across all these really inspiring blogs and immediately knew I had to be a part of this world. I remember my husband picking me up from work and I declared to him that I was going to start a business making hand made items! I didn’t know what…but I was going to figure it out and be a part of this new community I had just discovered! Fast forward a few months and I’ve started my little fledgling business. Inspired by all the amazing design blogs out there, I’m starting my own blog to track my progress of White Nest.